If you are looking to have some custom designs or unique markings painted on your property, parking garage, or parking lot, the custom stenciling experts at EverLine Coatings and Services are able to help with all of your custom stenciling needs. 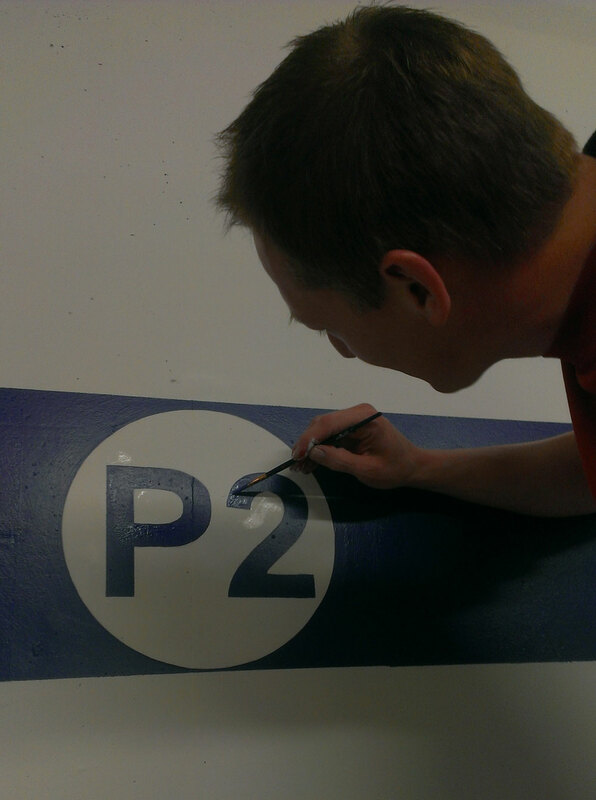 Whether you need individual parking stalls labeled, special lanes marked, or even just different sections to help lot users figure out where they parked their vehicle; our Toronto custom stenciling experts can get the job done. We are able to cut any custom stencils you may need and provide professional painting services to go along with them to ensure accurate markings and designs. If you want to display your branding on your parking lot or property, our Toronto custom stencils for painting are the way to go. 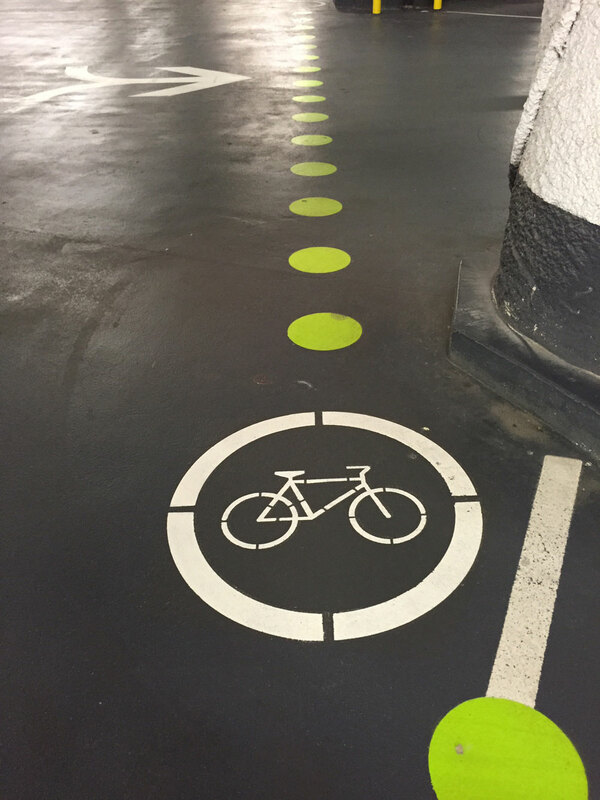 Our custom made stencils enable our clients to add their logo or any designs that they wish to their parking garage or parking lot to make your brand and property stand out from your competitors. If you have any wall stencil ideas, we can make your ideas a reality with our personalized wall stencils. We can bring your property to life with our Toronto custom stenciling services. EverLine is proud to be considered one of the best custom stenciling services in Toronto. We have been completing custom stenciling projects in Toronto for decades. Because of this, our experienced stenciling crews have seen it all and done it before. They can ensure the perfect execution of any design that you may need to be stenciled onto a surface on your property. Unlike some of our competitors, we do not thin the painting products that we use. We apply all of our paint products according to manufacturer specifications to ensure that your Toronto custom stencils will look great for years to come. The secret to our quality work comes from our stenciling professionals and the products and equipment that they use. The paint we use for our custom made stencils is some of the most durable paints available on the market. That paint is applied by our professionals with the top of the line custom stenciling equipment that ensures accuracy and great results with every project that we complete. Thanks to the extensive amounts of training and decades of experience that our Toronto custom stenciling crews have, we have established ourselves as the custom stenciling experts in Toronto. At EverLine Coatings and Services, we know that providing quality Toronto custom stenciling services requires us to have incredible attention to detail and precision to ensure quality results. To help ensure that our Toronto custom stenciling crews are able to deliver on every project that they complete, we continually train our Toronto custom stencil experts on how to use our custom made stenciling equipment and the latest application techniques. Because of our commitment to use the best equipment available and continually innovate, we are considered the custom stenciling experts in Toronto. When EverLine is providing it’s custom stenciling services to your property, you can rest assured that our crews will produce phenomenal results that will exceed your expectations. To help our crews complete your Toronto custom stenciling project in a timely manner, there are a few steps you can take in preparation. First, please make sure that the surface that is going to be stenciled and painted has been cleared of all debris, and that the area is free of any vehicles, obstacles or other obstructions. This will ensure that our crews have the needed space to set up the stencils for painting and that they can finish the project. Secondly, please clean the surface before our crews arrive. Having a clean surface is vital to ensuring that the paint will have a good bond with the surface and that our crews that can deliver a precise application that will look great for years to come. At EverLine Coatings and Services, we believe that providing excellent value to our customers is one of the keys to our success. We also believe that every Toronto custom stenciling project is unique and should be treated accordingly. To ensure that our clients receive the most value possible with our Toronto personalized wall stencils and other stenciling services, we price our projects on a per job basis. We consult our clients to get a good understanding of their custom stenciling needs and assess the area to be painted. It is important to understand the scope of the project as there are a lot of factors that can affect the cost of one of our custom stenciling projects. We work with our clients to understand all of the details regarding the project at hand so we can provide a quote that will fit within their budget and exceed their expectations. If you require a quote for your upcoming Toronto custom stenciling project, please contact us for a free estimate.